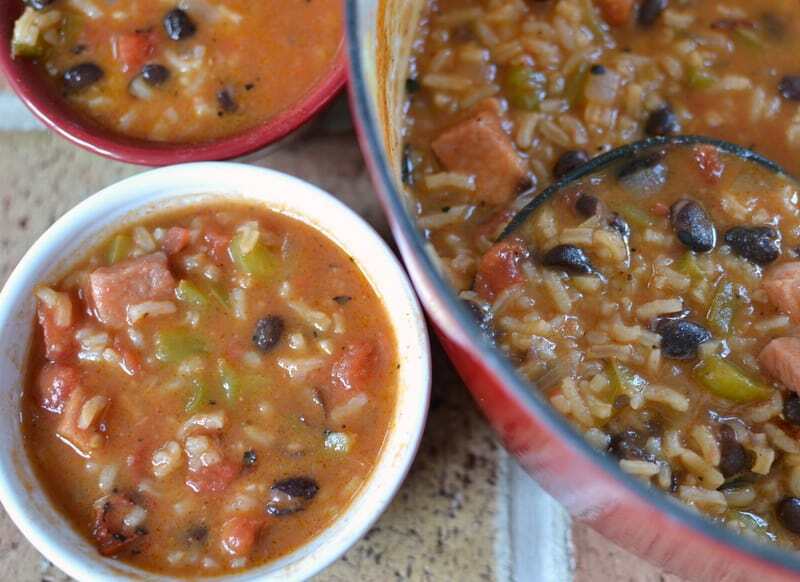 This is the time of year for awesome soups, chowders, stews and chilis. 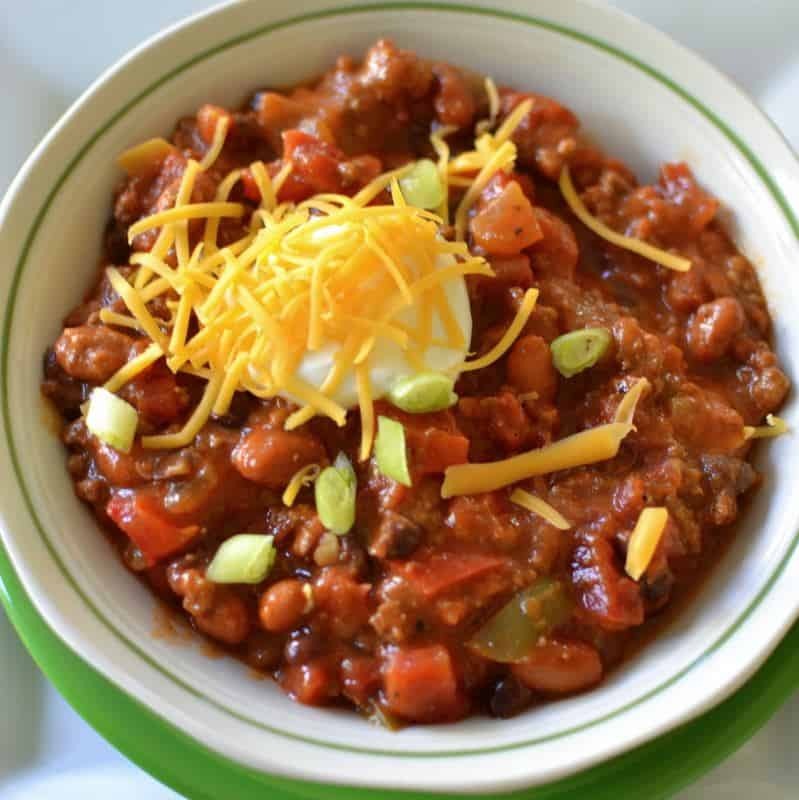 This Thick Hearty Beef and Bean Chili is one of my favorites. 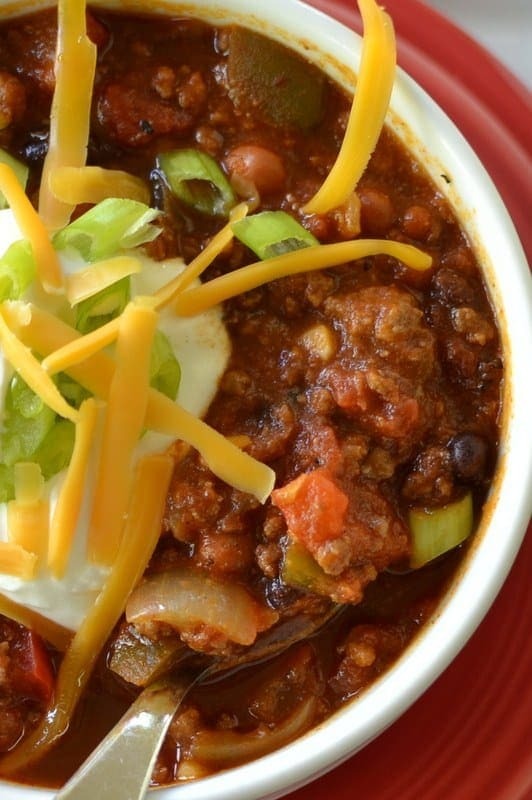 Nothing better than a big thick bowl of chili. You know the kind that is almost thick enough for your spoon to stand up. You can serve it over spaghetti noodles, mac n cheese or with a side of corn bread. 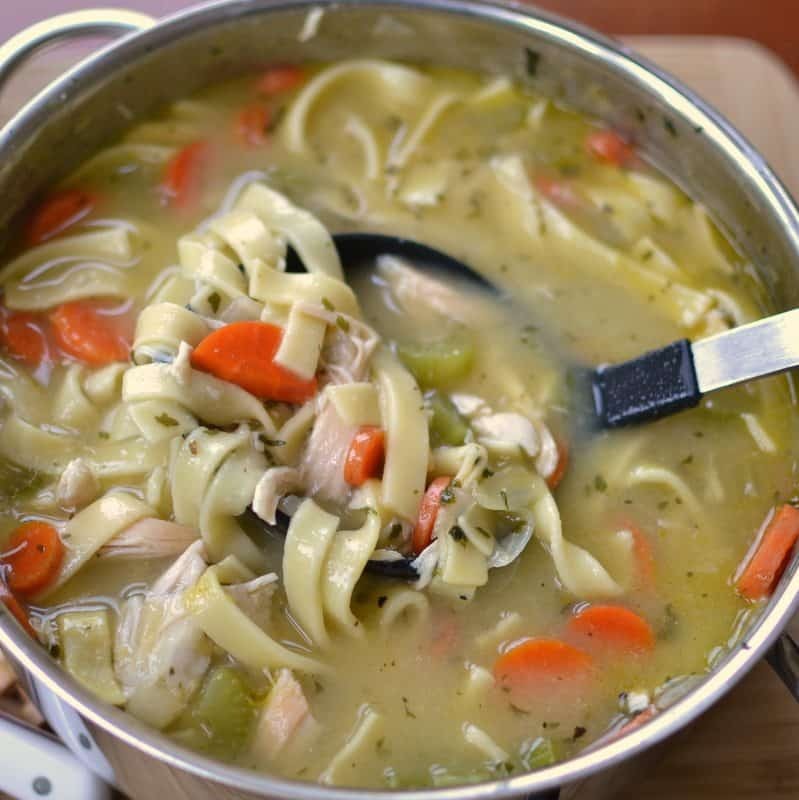 Have you tried any of my other soups and stews? Southwest Chowder with Cornbread Dumplings, White Chicken Chili and 30 Minute Stuffed Pepper Soup are just a few family favorites. 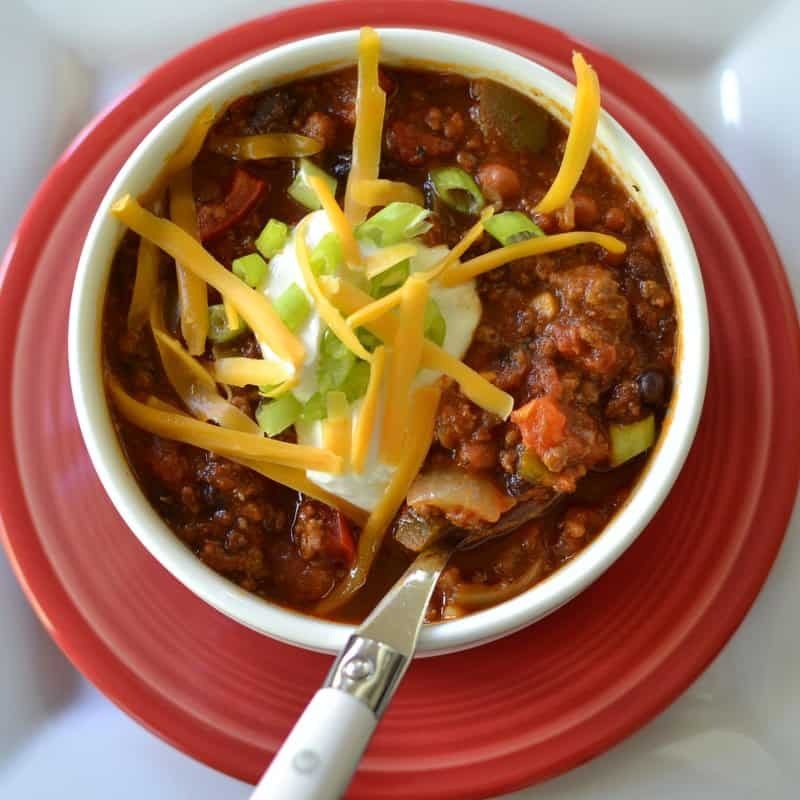 This Thick Hearty Beef and Bean Chili can easily be adapted to the crock pot by cooking the beef in a skillet first. For added flavor; once the beef is browned add the onions, peppers and garlic and saute for 2-3 minutes. 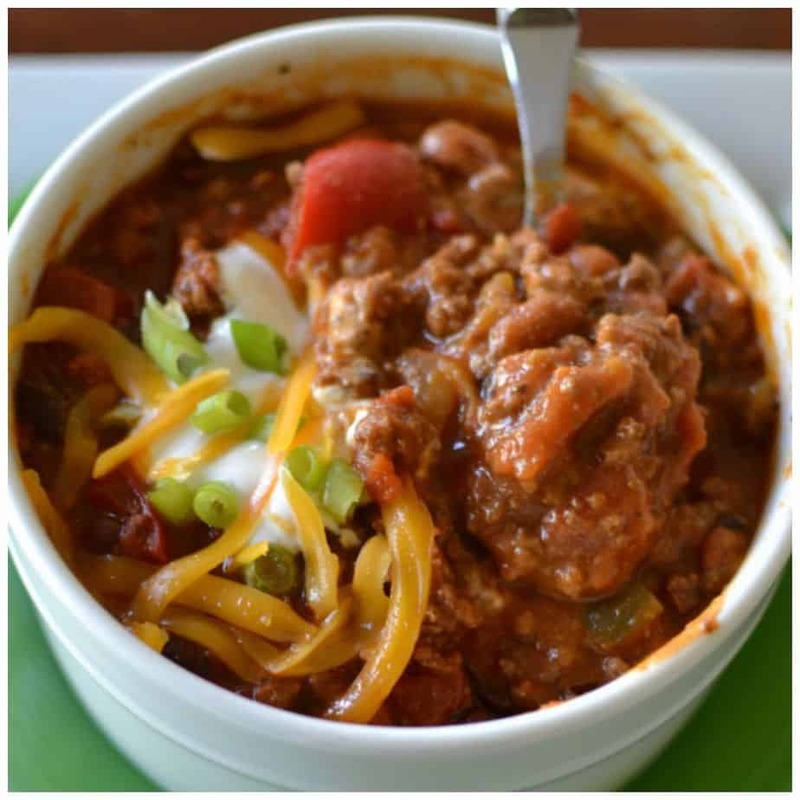 It will give your crock pot chili just a little added flavor and edge!! This Thick Hearty Beef and Bean Chili combines ground beef, black beans, pinto beans, onions, garlic, red and green peppers, salsa style tomatoes and a perfect blend of spices. So if you have a chill in your bones or there is a chill coming your way than put a big pot of Thick Hearty Beef and Bean Chili on the stove. Plop your buns down on the sofa, turn on your favorite classic movie and enjoying the great smells of your masterpiece simmering on the stove! In large stockpot brown ground beef over medium heat. Add onions and peppers and cook for 4-5 minutes. Add garlic and cook for additional 90 seconds. Add beans, tomato puree, salsa style tomatoes, cumin, oregano, paprika, chili powder, onion powder and brown sugar. Simmer for 1 hour up to all day. The longer it simmers the better it will taste. Top with sour cream, shredded cheddar and green onions. I make your 30 minute stuffed pepper soup all the time. In fact we had it just last week. Thanks for sharing all your recipes. Awesome! You are most welcome!! My pleasure!! So glad that you like the soup! This looks really good. I am going to make it this weekend. Thank you Terri! I love a good bowl of chili! Happy cooking! !